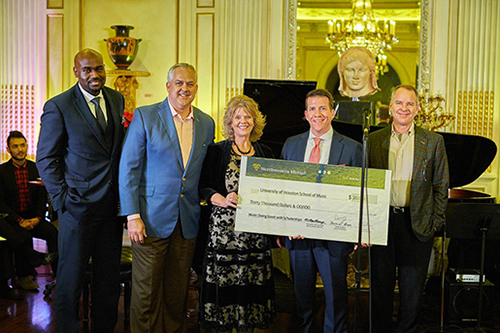 In 2017, Music Doing Good gained a valuable community partner in Northwestern Mutual when we hosted a pre-Super Bowl party at Chateau Carnarvon, which raised $100,000 worth of in-kind donations and netted $30,000 in support of President’s Leadership Council scholarships. At the “Generosity” concert, we presented them with an additional $30,000 to support the College-Bound Scholarship program at University of Houston in the coming year. Read more here. In 2018, Devin joined the American Heart Association Board of Directors for Montgomery County, as well as become a member of the Executive Leadership Team for this years "Go Red for Women" brunch, and a team captain of the Montgomery County Heart Walk. Read More here. In 2018, Devin participated in the 8th annual Home of Hope Golf tournament, benefiting adolescent victims of human trafficking. Home of Hope provides long term care, rehabilitation, and healing for victims of human trafficking abuse. Devin is also professionally involved with The Woodlands Chamber of Commerce and the Stephen F. Austin State University Alumni Association; The Woodlands, Texas Chapter. Devin and his family are members of The United Methodist Church of The Woodlands.